"Beauty and danger are the promises of California's Middle Fork of the American River. 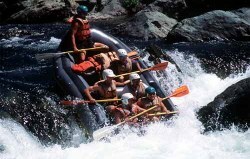 The whitewater rafting run that starts at the Oxbow Powerhouse includes the Tunnel Chute, Ruck-A-Chucky Falls, and Murderer's Bar rapid-obstacles that demand special techniques, equipment (helmets) and guiding skills. Ruck-A-Chucky Falls is a Class VI, mandatory portage." The Middle Fork American River is rated Class III-IV and runs through Tahoe National Forest. There are also numerous class II rapids scattered throughout the canyon. Large pools follow most of the rapids allowing you plenty of time to set up for the next rapid or to regroup after that unexpected, out-of-boat experience. The rapids on the Middle Fork are created by large boulders. 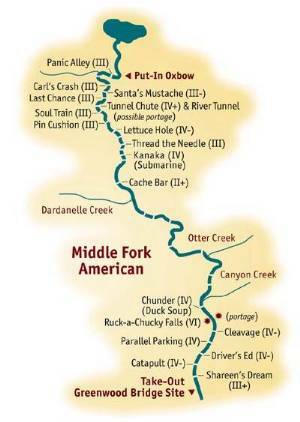 One of the most notable rapids on the Middle Fork American is Tunnel Chute. This is a man-maid rapid created during the mining days of the late 1800's. Black powder was used to blast through the cliff wall, diverting the water out of the oxbow so it could then be mined for gold. There are many sharp rocks hidden in the chute...so think twice before you swim it. If the water is running above 1700 cfs you might want to consider portaging Tunnel Chute. The Ruck-A-Chucky Rapid is an unrunnable Class VI 30 foot waterfall. You can portage this rapid via river right. The portage itself is about 100 yards long and takes about 1 hour depending the number of boats you have. On busy weekends, the portage can get quite congested, so get in line and take a number. Commercial rafting companies usually send the boats down the falls and retreive them at the bottom. Watch how the rafting companies negotiate the portage and feel free to ask a guide for directions.